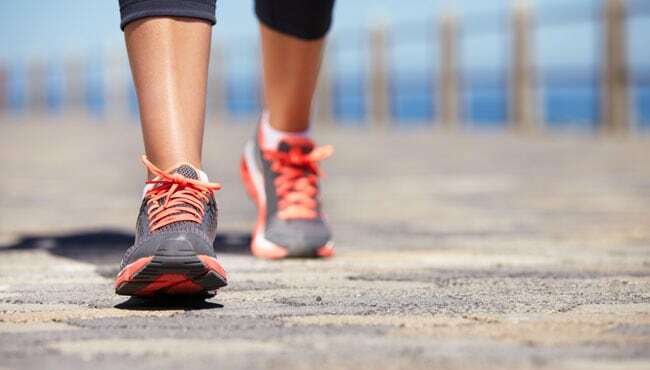 Health experts say that you should get at least 10,000 steps per day. All those steps can make a big difference! The physical and psychological benefits of walking are overwhelming. As a low-impact, low-stress form of exercise, walking for fitness will improve your cardiovascular health without the risk of running. It’s an easy way to improve your mental health, and it’s easy to add into your routine. Of course, you might already be walking a lot. If you’re on your feet at work, you’ll no doubt walk more than 10,000 steps without any extra jaunts for pleasure. The average person will walk over 100,000 miles in their lifetime. That’s the equivalent of 3 cross-country hikes across the USA! Whether you walk for fun, fitness, or for work, you’ll need the best walking shoes you can get. Without the proper footwear, you’ll be at risk for soreness and pain in your feet, joints and back. But which kicks are worth your money? We’ve found the best-rated new pairs available online. We picked three for work, three for dressier occasions, and three for hiking and trail adventures. You’ll find our top picks in each category on this page, with short reviews to help you narrow down your search. Click on any category to find more of our favorite options! 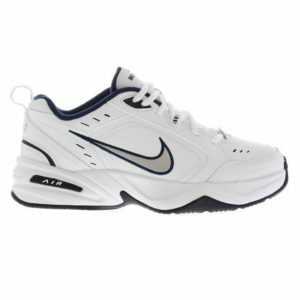 These Nike trainers are ideal for a casual men’s walking shoe! They’re built to handle gym trips and casual sports, so walking is no problem for them. If you can get away without looking formal, or are looking for something to take on weekend jaunts, you’ll love these. The best part of these is the deep cushion. They’ve got plenty of padding to keep you comfortable through the day. The full-length midsole cushion is made from lightweight foam, so you don’t feel weighed-down. Their leather uppers give you a classic trainer look with a finish that’s easy to maintain. As long as you condition them regularly, they stay looking great for years of wear. Even the white finishes are easy to maintain with a magic eraser. We also love that the leather is broken up by subtle mesh sections, which is important for breathability on walks! These stay much cooler than solid leather uppers. The traction is also a standout feature. Most sneaks slide around in wet conditions or on smooth surfaces, but the basketball pedigree on the Nike’s stands out! They keep their grip on the slipperiest floors. They’ve also got pivot circles and heel treads in the outsoles, so if you feel like playing a set instead of going for a walk, you only need one pair of sneakers. 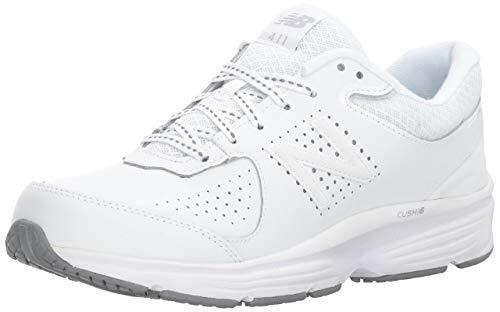 Even though they’re thickly padded and supportive, they’re sleeker than other men’s walking shoes. These are just this side of the “Dad shoe” category. They’re street-smart without sacrificing any comfort features. 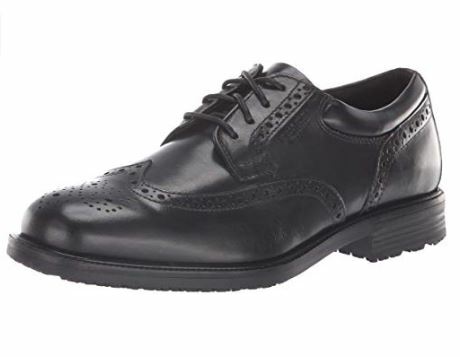 Our top choice for the best men’s dress shoes are these Oxfords from Rockport. They combine a relatively sharp, classy look with a padded, comfortable fit. The leather upper is available in a few smooth finishes, to suit your wardrobe. This is as comfortable as classy shoes come! We love the clever design, which has waterproofing throughout. We’ve all been there–you take out your best brogues for the big meeting, only to have them ruined by a surprised downpour. That’s not something you’ll ever have to worry about with the Rockports. Best of all, you’d never know it from the outside. They’re practical without being eyesores. 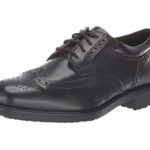 So, you’ve got a practical, comfortable, versatile dress shoe. How many times have you heard those words used around formal apparel? Between the leather upper, airy sole and the supportive insole, they’re polished enough for the office while being comfy enough for the walk to work. Previous buyers said they were super durable, too. They stayed comfortable and intact for years of daily use! 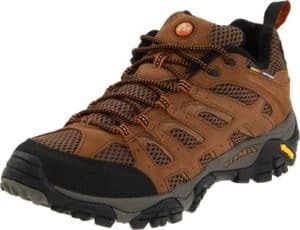 This hiking shoe from Merrell is our top off-road choice for men for good reasons! They’re incredibly popular across all demographics thanks to their legendary reputation for comfort and quality. We love the rugged Vibram soles on these kicks, which grip like nothing else we’ve found for the trail or for unmarked terrain. 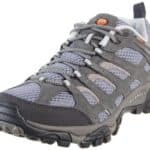 They’re also some of the airiest hiking shoes that can handle the rough and tumble of off-road walking.You won’t have to worry about these getting smelly, and your feet will stay comfortable for the whole hike. There are rubber toe bumpers and heel counters to keep you safe on rocks and roots, as well as an air-cushion layer in the middle of the sole to keep your arch and joints protected. The Merrell’s are one of the most fashion-friendly hikers we’ve seen on the market, too, with over a dozen color combinations. Check them out, outdoorsmen! This walking shoe is from New Balance, one of the most popular footwear brands out there. The company has a great reputation for their support and sophistication, and these new walkers are no exception! The WW411v2 uses gel padding to provide bounce and cushion without the weight of rubber. We like it because it doesn’t require any wearing in. These are comfortable from the first walk! Gel also holds up to extended use better than foam. There’s enough support for pronation control, and previous buyers said they helped with chronic foot and joint pain. The upper is made from mesh, providing ventilation with a snug fit. Overall, reviewers said they made walking a breeze, and stayed on their feet without soreness. 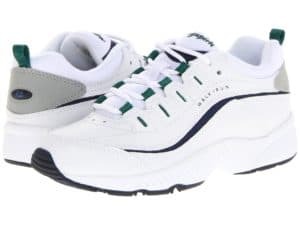 They’re a great choice for casual walking around the neighborhood or on paths. Previous buyers said that even feet that never seemed to fit in any shoes before were finally at home in the WW411v2’s! They’re definitely our favorites for women walking for fitness or recreation! Dansko clogs are instantly recognizable. The brand makes some of the most popular work footwear in the world. 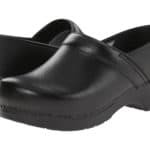 These are Dansko’s best-selling model! They’ve got a worked leather upper, available in lots of different finishes and designs. The sole is made from a signature blend of cork and memory foam. It provides strong arch support, heel elevation, and promotes good posture. And with the memory foam layer, you’ll have just enough cushion to get you through the day. 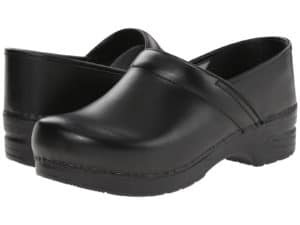 The open clog design leaves room for your toes and heels, which reviewers loved. Plus, they look fantastic. These are the perfect choice for the professional woman who wants to maintain her own style at work! Buyers are extremely loyal, and as you’ll see in reviews, many have come back for their 3rd or 4th pair! Our top choice for female adventurers comes from Merrell, one of the top brands for outdoor clothing and equipment. The Moab Ventilator features gender-specific midsole cushioning which is designed to work with a woman’s natural gait. That’s a big plus over more androgynous hikers, which tend to be clunky and awkward for women to use. The Moab’s sole is made from VIBRAM material for long-lasting traction. Overall, it’s designed to provide maximum support and stability–giving you the effect of a full boot in a much more streamlined design. Reviewers said it fits stably and comfortably, and is rugged enough to handle any trail. They said that after long, hard hikes, they were thrilled to find that they didn’t have any blisters whatsoever! If you’re a serious hiker, this is the pair for you! These Reebok’s are some of our favorite new shoes–in any category! We never actually got a chance to try the originals (these are the second generation), but we’re absolutely loving the latest Skyscape Runaround’s. They’re lightweight, low-profile shoes for the modern woman about town. They come in lots of fun colors, and they have a classic yet up-to-date look. These are fairly minimalist, but they have some secrets going on under the surface. The footbed is made from a special memory foam material that’s much lighter than traditional polyurethane. So, these end up being super cushy without any clunk. Best of all, you can throw them in the wash if they get muddy or start to smell. They’re completely safe to go through the laundry, even in the dryer! If you’re looking for pure, low maintenance comfort, these are for you! With a breathable leather upper and lightweight rubber sole, these classic rockers are easy to take care of. Plus, they’re very padded. There’s a cushioned footbed and removable foam sock-liner. With a slightly elevated heel, they’ll help you maintain good posture while you’re out and about. Best of all, they won’t break the bank. This makes them a great choice for traveling, since you won’t have to worry about wearing a hole in your favorite pair. These are some of the best walking sneakers that won’t break the bank. Reviewers said they’re comfortable, simple, and surprisingly durable. When it comes to walking shoes, and especially hiking and hybrid styles, nobody does it quite like Keen! These are more city shoes than hiking footwear, but they have a lot of elements taken from the more heavy-duty styles in Keen’s lineup. They’re fantastic lookers, first of all. These Austin’s have sleek leather uppers in a range of blacks, browns, and olives. They keep their finish very well, and they’re made to handle weather better than your average leather sneaker style. They’re water-resistant, if not completely waterproof. Think of these as a hip, practical twist on the classic Oxford! Another big upgrade over the traditional Oxford is the great arch support and anatomical support the Keen’s provide. They’re a heck of a lot healthier for your feet (and comfortable on long walks) than most soles in Oxfords and other leather walkers. 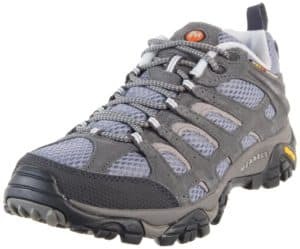 They have Keen’s distinctive toe bumper, just like the company’s hiking styles. The bumper protects you from stubs and other annoying walking hazards. It’s great if you walk primarily outdoors, but it’s also simply a nice feature to have. Oh, and they have fantastic traction as well! 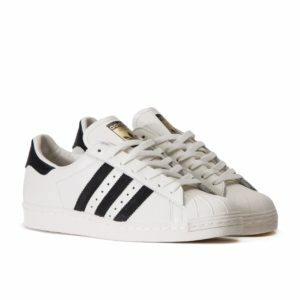 Available in a wide variety of color options and sizes, the Adidas Original Superstar 2 is a great sneaker option for small children. They’re built just like their bigger counterparts, made from a genuine leather upper and rubber sole. The triple hook-and-loop straps make it quick and easy to put these on and take them off. The sturdy, grip-ready outsole that adds a ton of support and traction, keeping your little one safe and firmly planted on the ground. It’s perfect for a little explorer to get used to different surfaces! These fit true to size, and include a breathable mesh lining as well as a removable Ortholite insole. Previous buyers said they’re both comfortable and durable, and the best part is the price! These baby lace-ups combine a classic design with modern versatility. The Sensory Response Technology built into them allows for a personalized first walking experience. It’s designed to help your tyke get use to different textures and sensations on pavement, dirt, or grass. The footbed is self-molding, with a contoured heel cradle and rounded sides for preventing falls. 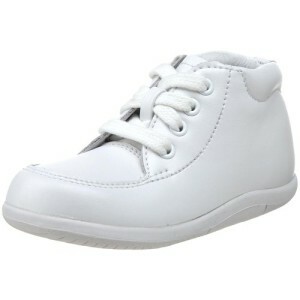 The sole is extra grippy, and parents said it’s great for helping little ones learn to walk steadily. All of the linings are both moisture-wicking and eco-friendly. Parents wrote that even children who were reluctant or having some issues walking found extra stability and confidence with the Grayson’s. They also loved that they wipe clean easily and don’t show dirt. These are a classic for a reason! Of course, even our smallest kids want to be part of the new athletic-wear fashion craze! These Saucony’s are perfect for the modern munchkin! The Jazz Hook and Loop sneaker is available in an expansive variety of bold and bright color combinations (25 in all! ), with plenty of options for sizes. 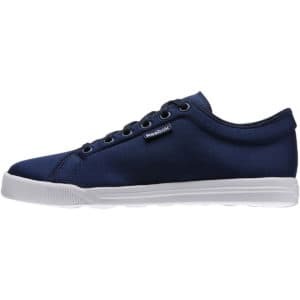 Providing a touch of classic, retro style, these sneakers also offer plenty of grip and traction in the rubber outsoles. Parents say they’re an excellent choice for outdoor play and rough-and-tumble kid activities. The upper is made from a mixture of suede and nylon for ventilation and durability. Just like the adult versions of these shoes, they have a contrast sockliner and outsole. 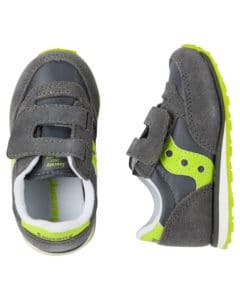 Hook-and-loop closures deliver a snug yet comfortable fit for your little one’s feet. These Velcro sneakers won’t break the bank–even though they certainly look like they might! You’ll want to start by deciding whether you’re looking for a great all-around pair or some kicks for a specific purpose. Depending on your lifestyle, you may be shopping for one pair or many! If you’re a casual walker, and keep to pretty uniform surfaces, you can probably get away with one. The more time you spend hiking, for instance, the more you’ll want to have a dedicated pair just for that. Specialized footwear provides support and comfort specific to the activity that you’ll be doing! Plus, if you have specialized options, you’ll put less wear and tear on each pair that you own. And remember that while some general-purpose pairs can be used for multiple activities, they might not be meant for them. This could mean a decrease in longevity, and potential injury for you! 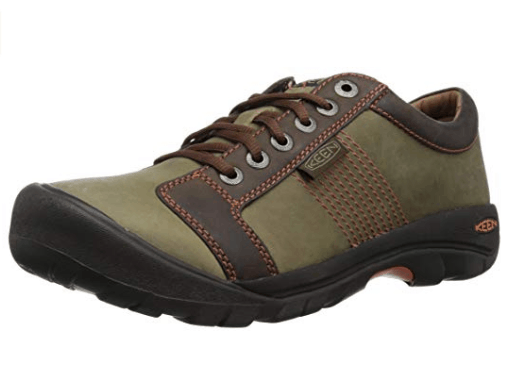 Ask yourself whether you’re looking for a walking shoe for work or play, indoors or outdoors. Are you looking to have one pair for everything? Then you’ll want to make sure your new ones fulfill all the specific criteria for each activity! Depending on whether your walking shoes will be your primary pair, they may be a small or large investment. In some cases, like people who are shopping for something to wear to messy workplaces, it makes sense to buy something that will be easy to replace. But in a lot of cases, you get what you pay for. Better quality hiking boots, for instance, will have high-durability soles, water resistance, traction, and more. These features make for a safer, more comfortable hike. However, there are practical, inexpensive options available for each type, and even the high-quality options shouldn’t break the bank. If you have specialized footwear needs and will require orthotics, you’ll want to plan on spending money on inserts as well. Whether you walk all day around a warehouse or stand behind a counter, you want to be at your best during the work day. Attractive footwear means you’ll feel more confident and comfortable in any work environment! You’ll want to consider your workplace requirements, and whether or not there’s a dress code or general rules of etiquette. You’ll also want to be careful of fancier options if your workplace gets dirty or messy. The most stylish choice might be inappropriate for a warehouse, for instance, but you’ll still want to maintain a level of professionalism. In an office, you’ll be able to sacrifice a bit of traction and ruggedness for added style and comfort. Of course, more cushioned shoes will be less sleek and streamlined. But you shouldn’t have to totally sacrifice style for comfort! We’ve found a wide range of options which can fit easily into most wardrobes. Depending on how much you walk in them, shoes can last a long time. You’ll get a longer life out of your kicks if you have a few pairs and rotate them. Or, you can have specific shoes for activities (work, walking, tennis, hiking, etc.). That’ll keep wear and tear spread out, instead of concentrated in one pair. If you want longer-lasting footwear, look for durable materials and reinforcements like EVA foam cushioning, leather uppers, and well-built sock-liners. Some shoes also have outsole reinforcements to prevent long-term wear and tear. They’re designed specifically to cover the areas that see the most wear from day to day. And you’ll want to find something that will be easy to maintain. All the best shoes for walking should have a few basic support features. You’ll want a sole with cushioning throughout. EVA and other types of foam are often used to provide contouring and support for individual feet. You can also look for support in specific regions of your foot. Generally, a good footbed will have pronounced arch support and midsole cushioning. More supportive shoes might have heel stability control, pronation correction, etc. If you have special foot conditions, the more support the better! And remember that depending on where and how you’re walking, you’ll want different levels of cushioning vs. stability. We like all the best walking shoes we’ve suggested here, but if we had to choose just one we think the Nike Men’s Air Monach come out on top for their extreme style! Get to know your foot before you buy! Are you more comfortable in cushioned sneakers, or low-profile, flat loafers? Do you have a wide foot, requiring a bigger toe box? If you’ve got a high arch, a flat foot, or any other condition, you’ll also want to know about that before you shop. You’ll be able to narrow down your options based on what suits your own foot type! We also have comparisons of the best shoes for standing all day, so if you’d like shoes that are great for standing, definitely check those reviews out! 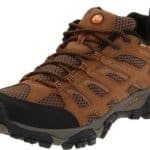 Check out our other topmost comfortable recommendations at bestwalkingfeet.com!